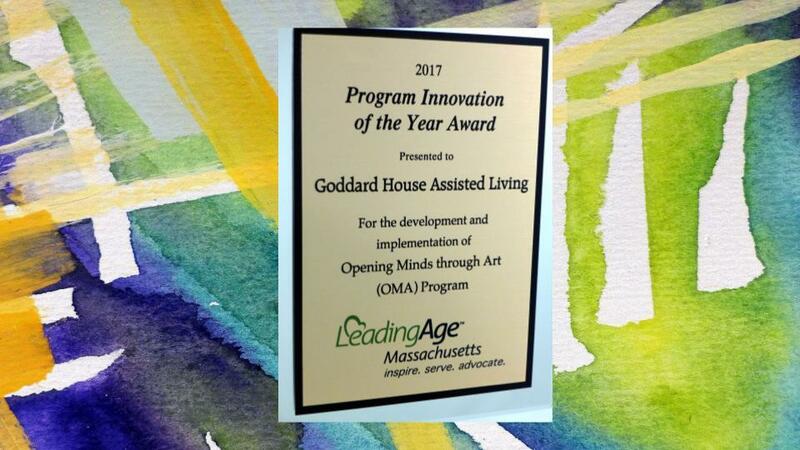 Goddard House has been awarded the 2017 Program Innovation of the Year Award by LeadingAGE Massachusetts. 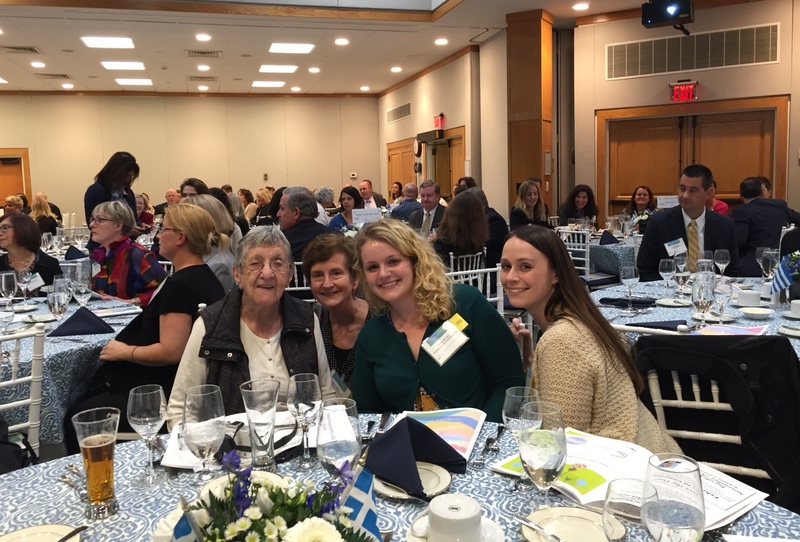 The Award is given for the development and implementation of a creative and innovative program that measurably benefits residents and/or staff – and in this case, students training at Goddard House from Lesley University. The Opening Minds through Art program for persons living with dementia is entering its second year at Goddard House Assisted Living in Brookline. In 2016-17, partly funded by grants, staff trained at the Scripps Gerontology Center at Miami University in Oxford, OH with OMA creator Dr. Elizabeth “Like” Lokon, becoming the first facilitators in Massachusetts. Goddard House piloted the full program on Olmsted Place, their memory support neighborhood with two groups of resident artists. Pictured here after accepting the award for Goddard House are, from left, Bernice Zigas – OMA artist, Ginny Mazur – OMA Facilitator, Sarina Van Zyl – OMA Volunteer and Jennifer Miller – OMA Facilitator. For more on OMA visit www.goddardhouse.org and www.scrippsoma.org. Special thanks to the National Center for Creative Aging (www.creativeaging.org) and for LeadingAGE in Washington, DC for introducing Goddard House to OMA at their National Conferences in 2015, inspiring staff to take the training. For more information contact Ginny Mazur, Community Partnership Director, ([email protected]) or Lance Chapman, Executive Director, ([email protected]) at Goddard House.